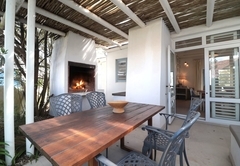 Dunesberry is a property providing self catering in Paternoster for up to 4 guests visiting the Cape West Coast region. 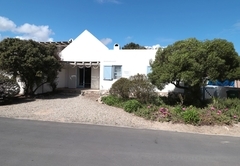 Dunesberry offers comfortable accommodation in Paternoster, just a stones throw away from the beach, in fact its just 50 meters away. From here you are close to a number of attractions and activities in the area. 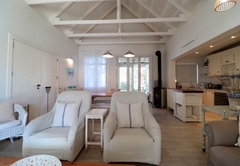 Dunesberry is a self catering holiday home furnished with a double bed in the main bedroom and twin beds in the second bedroom. Bed linen and towels are provided. There is a shared bathroom that is fitted with a basin, shower, bath and a toilet. The open plan living area has built-in fireplace and comfortable furniture so that guests are able to relax. There is also a TV with full DStv. 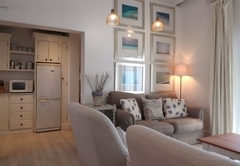 The self contained kitchenette has everything needed for guests to enjoy their stay and cook their meals. It consists of a fridge / freezer, microwave, stove, oven, dishwasher and tea / coffee making facilities. 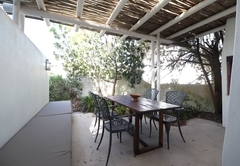 Outside, guests have access to an outdoor braai area as well as off-street parking. Paternoster is an all year round destination famous for its traditional fisherman’s architecture and endless pristine sandy white beaches. Visitors to Paternoster delight in watching whales and dolphins frolicking in the ocean (dependent on the time of year). 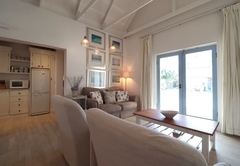 A beautifully decorated, cosy cottage offering two bedrooms. 1 en-suite with shower & 1 shared with bath & shower over bath. 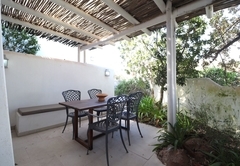 It offers full DStv and no view, although it is situated approximately 50m from the beach. Response timeDunesberry typically responds to requests in 5-10 minutes. Child policyChildren six years and older are welcome.